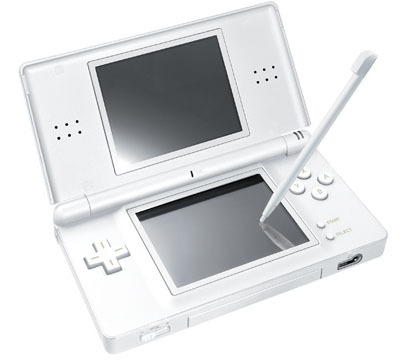 Nintendo DS Lite is a dual screen portable handheld game console which is a smaller, slimmer and lighter model redesigned from the hugely popular Nintendo DS model. Other features enhancement over the original Nintendo DS brighter LCD screens with brightness control, better placement of built-in microphone, realignment of Power button, D-Pad, face buttons, and a larger stylus. In addition, DS Lite has longer battery life compared with DS, and is backward compatible Game Boy Advance titles as well as play games made specifically for Nintendo DS. Wi-Fi connectivity also allows you to play wirelessly against nearby friends, or play online against world-wide gamers with Nintendo Wi-Fi Connection. Blogcritics gave the Nintendo DS Lite gaming console a five star rating after review, and concluded that “my expectations were quite high before I even touched the product. Having it in my hands, it has far exceeded everything I had hoped for. The screens are brighter than anticipated, and the boost in color was entirely unexpected. The new design of the DS fixes my main complaint about the original, that clunky, ugly handheld.